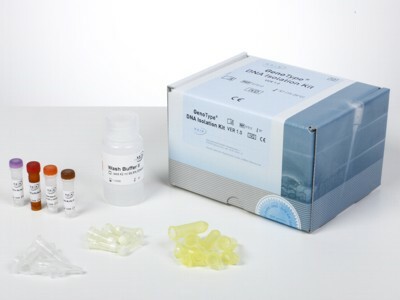 With the GenoType DNA Isolation Kit, you can rapidly extract highly purified DNA for use in conventional amplification procedures. Even small volumes (1-50 µl) are sufficient for this and yet ensure a high DNA yield (1-2 µg DNA). Easy-to-use: simple performance in only a few work steps permits rapid DNA extraction. Reliable: GenoType DNA Isolation Kit enables the extraction of DNA from a small starting volume and yet guarantees a high yield. Optimal suitability for routine use: GenoType DNA Isolation Kit allows the extraction and purification of genomic DNA from various starting materials and can therefore be used in a versatile way in your laboratory routines.